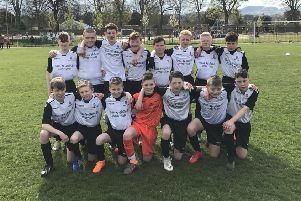 BROXBURN midfielder Craig Young bagged a hat-trick of assists as Athletic disposed of Maybole in this Scottish Junior Cup first-round replay – and then admitted that his ‘treble’ was to make up for the penalty he missed in the original tie. Broxburn drew 0-0 in Ayrshire two Saturdays ago, with Young spurning a chance from 12-yards – but Maybole were to get no favours this time as the hosts ran out comfortable 4-0 winners at New Albyn Park. Young was the mastermind behind this victory, as it was his precision passing which opened up the Maybole defence. In the 17th minute Broxburn took the lead, Zander Miller’s effort finding the net. In the 35th minute, Ross Nimmo had the simplest of jobs in scoring the second at the back post, drilling home an inch-perfect low cross from Young. Broxburn increased their lead within a minute of the restart, Young again providing the ammunition for Callum Rarity to head in another superb cross. Broxburn pushed on and were rewarded again just after the hour-mark with yet another fine goal from the feet of Young. Broxburn: Maley, Willems, Young, Locke, Rarity, Lochrie, Nimmo, Scott, Miller, Keast, Millar. Subs: McQuillan, Anderson, Blaikie, Donaldson, King. Maybole: Weir, Todd, Frame, McKay, Love, Cameron, Goodwin, Cuthbertson, Stevenson, Doolan, Shankland. Subs: Connor, Reilly, Thomson, Whittaker, Paterson.